A Chevrolet Traverse navigates the University of Michigan's Mcity track for autonomous vehicles on Monday. 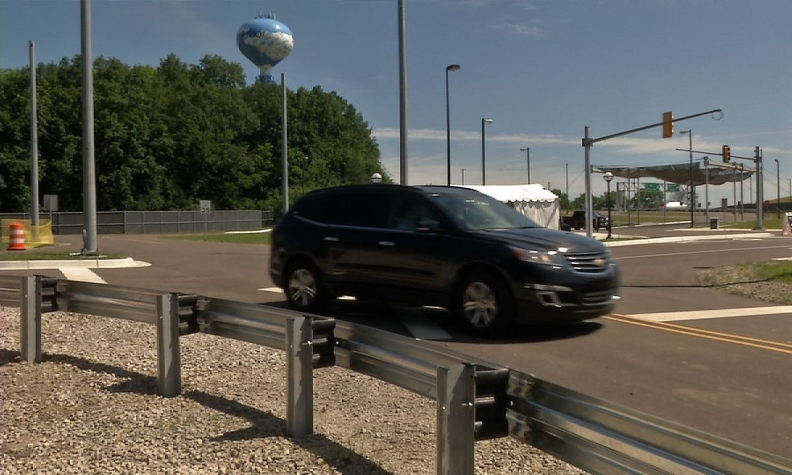 ANN ARBOR, Mich. -- Self-driving cars would be "better" tested on private test tracks than on public roads, said a U.S. senator who has authored several bills on advanced vehicle technologies, after Google Inc. disclosed injuries in its latest accident involving a prototype. Sen. Gary Peters, D-Mich., a member of the U.S. Senate Commerce, Science and Transportation Committee, made his remarks following the opening of the University of Michigan's Mcity track on Monday. Self-driving vehicles will be tested on public roads in Michigan in 2016, but "it's better to start in a closed facility" such as Mcity, a 32-acre facility "where companies can conduct more extreme tests," Peters said in an interview. "It is an incredibly hazardous environment to be out on the streets." Google, which has been developing self-driving cars since 2009, said on Friday that three of its employees were injured in a July 1 incident in California when one of its self-driving prototypes was rear-ended by another vehicle. "Our self-driving cars are being hit surprisingly often by other drivers who are distracted and not paying attention to the road," wrote Chris Urmson, director of Google's self-driving car project, in a blog post last Thursday. "The clear theme is human error and inattention" in those incidents. Google said its prototype vehicles have been involved in 14 collisions since 2010, including 11 in which the Google vehicle was rear-ended, often while stopped at a light or in slow-moving traffic on city streets. Peters said he was given a ride in one of the Google self-driving prototypes a year and a half ago. While on the freeway in California, he said, "another vehicle crossed into our lane," and the Google vehicle responded "seamlessly" while avoiding a collision. He said he thought the freeway incident "was a little bit unusual" and noted that driving on city streets "gets a lot more complicated." Testing on the Mcity track will "allow us ... to fully understand that very hazardous environment," he said. Google declined to comment on Peters' remarks. Michigan is among a handful of states to pass legislation enabling testing of self-driving cars on public roads. Among the partners in Mcity are Ford Motor Co., General Motors, Toyota Motor Corp., Nissan Motor Co. and Honda Motor Co.
A Ford spokesperson said on Monday the automaker already has been testing a Ford Fusion equipped with self-driving hardware and software at Mcity. A similar facility, GoMentum Station, opened earlier this year on the site of a former U.S. Naval base in northern California. Several carmakers, as well as Google, use the private facility to test self-driving vehicles.